"The more you watch Rogers, the more impressive he becomes. He is big, knows how to use his size and displays explosive straight-line speed in the open field. He has a tremendous size-to-speed ratio and he is strong. Rogers has the ability to out-muscle defensive backs in contested matchups as well as ward off tacklers after the catch. Drives defenders off the ball with nice a surge and is an imposing figure off the line. Shows a long, but explosive stride. He does a great job tracking the ball, while its in the air and possesses excellent body control to make acrobatic catches. He has excellent size and very good strength after the catch. Will stiff arm defenders and drag them for extra yards. He can win footraces and flashes the ability to be a legitimate home run threat. He is a huge threat on the fade and vertical routes He is very difficult to defend in the red zone. Presents a huge problem for smaller corners who try to cover or tackle him. He has very big, soft hands and shows the ability to pull the ball away in jump-ball situations. He is elusive for his size and shows a second gear in the open field. He has a wide wingspan that creates huge throwing windows. As impressive as his physical tools and upside are, he does not show a lot of wiggle or flexibility in his change-of-direction. Has some stiffness in the hips. You can see it as a route-runner and ball-carrier. His strength and first-step quickness can help him avoid the first guy, but he isn't a guy that will put multiple moves together in space to make people miss. Overall, Rogers is an impressive physical specimen and at times looks like a Calvin Johnson-type player. He is aggressive, makes plays and presents some difficult one-on-one mismatches for opposing defenses. Excellent prospect." I've vowed to stop following recruiting this year for several reasons, but one can't ignore a commitment this big. 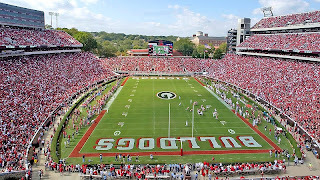 Until today, UGA's recruiting efforts haven't gotten any commitments from the highest profile recruits, although Jalen Fields is a huge get for us at a position of need. This is a departure from our normal efforts of having the entire class sewn up by September 1. That's not a bad thing, but you have to have some recruits left to get. A couple of guys (Tai-ler Jones and Jawuan James) have already gotten away because we've offered them after they established relationships with other schools. That's rattled some parts of Bulldog Nation. Maybe the Rogers commitment will quell some of those shouts. I think recruiting is momentum based also. With a recruit this caliber maybe other kids will jump on board. Not to kill the excitement but I'd love to see a big time DE commit instead of a WR. This team needs defensive help! I'm with you on not really following recruiting. I don't get why people get so worked up about it. Tennessee and Alabama fans go all nutty when they sign the "#1 rated player in the country", but who's to say that guy is going to amount to anything in college? It's hard to predict what a bunch of 18 year olds away from home the first time are going to do. Some have already athletically peaked by the time they reach college. Some fall into trouble with John Q. Law or other vices. Some have been told their whole life that they are the best thing since sliced bread and have never really worked hard off the field, but got by on sheer athleticism. Then they are thrust into a room with 50 other guys just as good or better than them and you don't know how they'll react to that. I just think recruiting is too fickle to take emotional rides. Anon at 4:11, you mean like Fields or BJ Butler? Great pickup for the Dawgs. WR rotation in '10 of A.J, Marlon, Rantaviouswootendaballcarrier, Tavares, and Da'Rick. That's just sick. Just hoping he can qualify. From what I have heard, it may be a tough task. Great haul by the Dawgs if he does though. Hobnail, you made me laugh.